Henry is a large snake. At his last check up he was more than 4 metres long. He lives in Lilongwe Wildlife Centre in a large enclosure where it is sometimes difficult to find him. I needed pictures of Henry for the Wildlife Centre so went in the enclosure with him. When I found him, I used my 18mm lens on my Nikon D200 camera. I handheld the camera and put it as low as I could and as close as I dared from Henry. 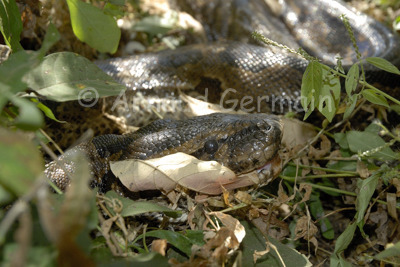 Pythons are not venomous but they can give a very nasty bite with their curved backwards teeth. I took a few pictures and then saw Henry's neck going into a nice "S" shape. I moved myself backwards just as he lounged to strike at me. Obviously I had outstayed my welcome. I got the message loud and clear and left Henry in peace.